Shared the stage with Sarah McLachlan, Miranda Lambert, and the Courtyard Hounds at Lilith Fair 2010. Showcased at the 2011 NACA Northern Plains Conference. Performed at DTE Energy Center, Big Ticket Festival, Bliss Fest, Traverse City Cherry Festival, TC Film Fest, The Music Hall of Williamsburg in New York, the opening of JetBlue's JFK terminal, Grand Traverse Opera House, and "Top of the Park" as part of Ann Arbor's Summer Festival. Opened for Grace Potter & The Nocturnals, Joey + Rory, Jay Buchanan, Juana Molina, and more. Jetty Rae is a singer and songwriter originally from Northern Michigan and has been singing, touring, and recording since 2004. She released her first full-length album "Blackberries" in 2007, November 2009 saw the release of her first EP entitled "Nobody", in July 2011 she released a lullaby album entitled "La La Lu and the Lazy Moon", and in February 2012 "Drowning in Grain" was released. Slowly but surely Jetty Rae's voice has begun to make ripples in the congested but exciting independent music scene. Jetty has garnered the attention of such entities as JetBlue when she played at opening of their new Terminal at JFK International Airport. MTV.com interviewed Jetty for their 'Needle In The Haystack' series, and her song 'I Love You,' was selected for a free download of the week and featured on their up-and-coming artist blog. You can also hear Jetty’s voice singing Truvia’s jingles on their 2012 television commercials. Jetty Rae shared the stage with Sarah McLachlan, Miranda Lambert, and Courtyard Hounds at Lilith Fair in Detroit where she was handpicked by Sarah McLachlan and Terry McBride as the featured local artist. Jetty's highly anticipated album "Drowning in Grain" was produced and recorded entirely by Jetty. She was inspired to take audio recording classes after becoming dissatisfied with her lack of control in her previous projects. She was inspired by the do-it yourself-ness by the likes of Imogen Heap, and Aimee Mann. 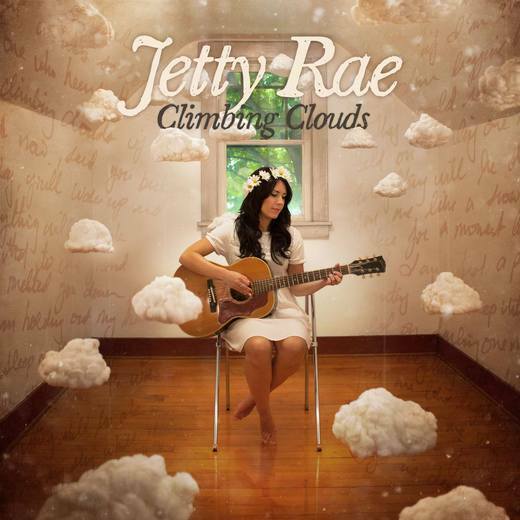 Jetty's 5th album, "Climbing Clouds", mixes stories of sorrow and triumph into a 6 song EP. Her influences include Jennifer Knapp, Brandi Carlile, Cat Power, Ray LaMontagne, Lauryn Hill, Patty Griffin, and many more. If you've been to a Jetty Rae show you can agree to the fact that song writing is her true forte, but how she marries her words to her voice and melodies is a thing to see. She has power, and restraint in her voice, the ability to pull at your heartstrings delicately like in 'Blink of an Eye.' On the other hand she also possesses the power to awaken a passion, a fight in all of us when she really belts it. Her hopes are to eventually start a label for independent artists like herself that will empower artists to start where they are. She is hoping to give them the tools, studio time, experience, and resources they need to succeed in making great art.